REVIEWS: "ELVIS: THE NEW RECORDINGS"
I normally don't write reviews but had to make an exception with this release. Here is a 'portrait' of times gone by, when the 'Opry' programs were popular for many of us especially during all night trips, keeping us connected to the real world. Living in Nashville during that time period I was fortunate in actually knowing and spending time with some of the people heard on the broadcasts, occasionally sharing the fun across the alley at 'Tootsies' during an 'Opry' performance or watching some of the acts from between the curtains of the Ryman. These were fun times for everyone involved, performers and spectaters alike. Much of this comes across during these recordings with outstanding clarity of voices and music. Many of the songs I have not heard in many years. so this was a pleasant surprise. A must for all Jim Reeves fans, you will not be disappointed! 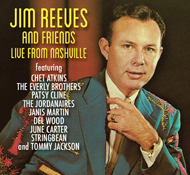 It's a shame I can only give "Jim Reeves and Friends Live from Nashville" only five stars - because it deserves 10! This CD is like having a front row seat and a perfect example of what makes the Grande Ole Opry GRAND! The marvelous remastering of yesteryear's chart toppers hit a high note thrill that's comparable to hearing them for the very, first time. Unlike the album released years ago by the Country Music Foundation, which featured just Jim singing on the Grand Ole Opry (and no dialog), "Jim Reeves And Friends Live From Nashville" gives us a wonderful opportunity to hear how he sounded in the context of the nation's longest-running radio show. It gave me goosebumps! The excitement is almost palpable as announcer Grant Turner steps up to the WSM microphone to announce, "…tonight starring JIM REEVES!" You hear the squeals and the thunderous applause as Jim starts to sing with that mellifluous voice of his. And what a voice it is! You will melt as he slides over the notes so smoothly. One can also imagine him swinging back and forth to some of his up tempo numbers, probably wearing his red tuxedo jacket and flashing that big, warm smile. This CD is really something special and makes you feel like you are sitting right there in the Ryman auditorium; except you didn't have to stand in a long line waiting to get in, or endure the uncomfortable wooden pews of the old tabernacle! A few of these tracks have circulated among fans over the years, on copies so many generations removed from the originals that they sounded muddy, with pops and clicks - I've heard a a few on YouTube. But NOTHING can match the superb sound quality on this CD! The restoration is unbelievably fantastic…far better than I ever imagined possible. Plus there's A LOT of new material here not found anyplace else. It's a treat to hear Jim sing songs live that we've previously only heard performed on his commercial records. Just listen to Millie Kirkham (who also backed Elvis) sing those high notes as the Jordanaires accompany Jim on a rousing version of "I Love You More"! There is a vibrancy here, an excitement that will engulf you. All of the performances are great. Chet Atkins proves why he was one of the world's finest guitar pickers. Del Wood pounds the ivories, playing an old rag time favorite. I loved the humorous banter Jim had with June Carter and how the flawless Mr. Reeves makes a little mistake but then comes back to solo on their duet, "Working Man Blues" -- a previously unreleased new song by Jim! One number I never particularly cared for, "Partners" is now one of my favorites once I've gotten to hear Jim sing it live. Same with "Highway To Nowhere" which he sings mellower. A very touching moment comes when Jim dedicates a song to his mother. How sweet! This has been a banner year for Jim Reeves releases ("The Great Jim Reeves" 8 CD set, also sold on Amazon, is a magnificent reworking of Jim's studio recordings with fresh new clarity and richness to his voice, plus appealing new overdubs by some talented musicians under the direction of producer Larry Jordan). But this new Opry CD has a charm all its own. It's more earthy, to be sure -- the performers obviously playing to a more rural audience of simple, hard-working people tapping their toes and letting their hair down on a Friday or Saturday night in Nashville! What a joy it is to experience these days gone by, as if through a magic time machine! As a person who likes live recordings, it just doesn't get any better than this - Jim Reeves and friends performing live on the Grand Ole Opry. Here you get to hear Jim Reeves hosting the Opry as opposed to just a collection of live Opry performances. "Arkansas Traveler" - I had long heard a rumor of this unreleased song by Jim Reeves from the Opry. At long last, now we have it. And how Jim Reeves "performs" this tune will probably surprise many. It certainly did me! We also get to hear a performance by Jim Reeves' band, The Blue Boys, which is a real treat. On this cd, you get a real sense of why the Grand Ole Opry was so special. Back in those days, all the performers knew each other and most of them were friends. It might be a surprise to know the Everly Brothers performed on the Opry, but they did. Here they are doing a song written by the great Roy Orbison - "Claudette". There's also a rocking performance by Janis Martin, who was called "The Female Elvis" and with her performance on this cd, you can understand why! I just wonder what the Opry management thought of her, back when the Opry was rather staid and uptight. No one could sing a gospel song like Jim Reeves, and there are several on this cd. The real clincher is the last song - "Danny Boy" which Reeves sings with such power. This song came to be associated with Jim Reeves, and was normally his encore performance. Grant Turner, longtime announcer at the Opry stated Jim Reeves always got a big hand when he performed this song. He also commented that you could hear a pin drop when he sang this song, such was Jim Reeves' hold on an audience. Any fan of Jim Reeves will want this cd. It presents Jim Reeves as no other release has, in a way you have never heard him before. Wonderful piece of music history! Wonderful collection! Here is a great new piece of country music history for all fans and especially fans of Reeves to enjoy! Features Jim Reeves, The Everly Brothers, Patsy Cline and many other greats! Too many great songs to pick just one! Pick up your copy today! Songs and production value are top-notch! What an exquisite CD. Great job as always. It was a good mix of instrumentals, duets and solos. Loved all the songs. Another gorgeous VM production with tasteful music and clear audio face-lift. It was equally powerful and amazing to listen to Jim sing as well as hear him interact with his Opry friends in his deep, mellow voice. It was also a treat to hear some of the old songs sung by Jim and the other artists and Jim's crystal clear voice giving the impression that you are sitting right there at the show listening to him. Oh, how I wished I had the fortune to sit on one of his shows! Thank you Larry Jordan for unearthing these rare artifacts and widening the landscape so we, as fans, can have the opportunity to listen to our favorite artist in more than one way. It is always a pleasure to listen to Jim in a different vein. I am amazed with all these wonderful surprises. We can't thank you enough for keeping Jim's legacy alive. Looking forward to your "what's next on the table." Another outstanding Jim Reeves album!! Thanks to Larry Jordan and Voice Masters for continuing to produce new material by one of the greatest voices of all time, Gentleman Jim Reeves!! What a fantastic c.d. Worth 10 stars.There is nothing more to add. The other reviewers have said it all. If you are going to buy a Jim Reeves c.d.,ever, then put this one at the TOP of the list. Another great job by Voicemaster. Very enjoyable, just delightful. My mother really enjoyed it. I think it brought some great memories for as child hearing the Opry. Sound is very good. A Keepsake for Generations to Come!! I received this CD in the mail yesterday, 11/7/2014 (I ordered it 11/5/14). THRILLED with the speedy delivery time, absolutely ENTHRALLED with the product!!! First, I want to say this. I have 4 different CD players, one of which is almost 10 years old, the other three are 5years old and newer. This CD played perfectly in ALL of them. I naturally put it on my Ipod immediately, bringing the number of Jim Reeves recordings on there to just over 1000. I am proud to say that 60 to 70% of those recordings are Voice Master and H&H releases! Now, to the "Live From Nashville" cd. Flawless, that is the first word to come to mind. I knew beyond a doubt that it would be "good", but I am once again so overjoyed that this is a once in a lifetime listening experience. Certainly, I love all of the music by all of the artists, the sound quality is crystal clear, but it is the banter between them that makes this such a joy to listen to. You will feel like you are literally in the audience at the Ryman, watching these legends do their thing!! If anyone has any fears or doubts as to the quality of this product, put them to rest. There are 1 or 2 people who consistently put negative reviews on EVERY Voice Master and H&H release. I don't know why. Their complaints are UNFOUNDED, and UNTRUE. For whatever reason, they have chosen to make it their lot in life to keep the music of this great singer out of the hands of his very loyal, and deserving fans. Take it from a lower middle class, working, single father... this music is a legacy for generations to come, and my 4 year old son is already a true Jim Reeves fan (I guess it is the soothing quality of his voice). Treat yourself to this CD, I promise you that you WILL NOT be disappointed!! Once again, we have another wonderful Jim Reeves release by the same producer who has given us so many other great releases! Here, we have live recordings by Jim and his friends that have never been heard before! This CD was pressed by a legitimate manufacturer, and is not inferior in any way. Ignore any negative reviews you see here. The man who posts these comments does so without any knowledge of the product whatsoever! He has been trying to deliberately mislead fans into thinking the producer's products are of sub-standard quality, and this is about as far from the truth as you can get! Read all the other reviews here, and see for yourself. If you're a true fan of Jim Reeves, then you will be delighted with this great new CD! I would advise anyone interested in this release not to pay attention to the braying of a donkey who has given this release a bad review. That review was made without even listening to the cd; therefore, it has no validity. It's only purpose is to try to negatively impact the sales of this cd. That person blindly gives bad reviews to all releases by the producer of this cd. Now to the cd... This release is, in fact, a very high quality release. You get the chance to hear Jim Reeves in a unique setting, from the Mother Church of Country Music - The Grand Ole Opry. There are fantastic, live versions of gospel songs. What a great performance of Danny Boy! There is just one fantastic performance after another. I had heard some of these performances over the years with bad audio quality. Now I finally get to hear them as they should be. Do yourself a favor and buy this cd.